I am excited to share this recipe since it was made by one of our lovely instagram followers, Michelle Jenkins who goes by the instagram handle "@dailywaffle". Michelle has been following us for quite some time now and overtime has shared some of her favorite recipes using our cheeses. This particular recipe was taken from the cook book Smitten Kitchen Every Day by Deb Perelman. 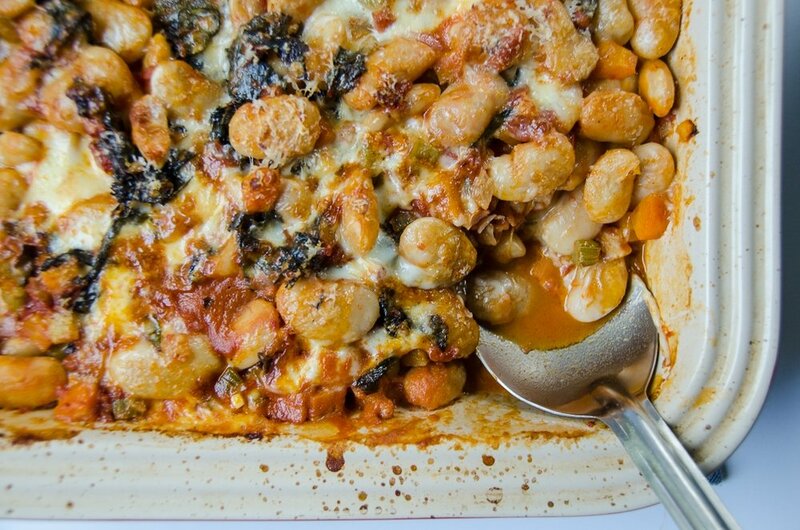 "Pizza Beans" is a bean and tomato bake that is the perfect dish for a cold and rainy day. Michelle added in pancetta, extra red pepper flakes, and topped off the whole dish with our fresh mozzarella. A simple and delcious meal the whole family can enjoy! Prepare the beans and vegetables: Heat the oven to 475 degrees. In a 2 1/2-to-3-quart (ideally oven-safe) deep sauté pan, braiser, or shallow Dutch oven, heat the olive oil on medium-high. Add the onion, celery, and carrots. Season well with salt and black or red pepper. Cook, sautéing, until the vegetables brown lightly, about 10 minutes. Add the garlic, and cook for 1 minute more. Add the wine, if using, to scrape up any stuck bits, then simmer until it disappears, 1 to 2 minutes. Add the kale, and cook for 1 to 2 minutes, until collapsed, then add the tomatoes and bring to a simmer. Add the beans, and, if the mixture looks too dry or thick (canned tomatoes range quite a bit in juiciness), add up to 3/4 cup broth, 1/4 cup at a time. Simmer the mixture together over medium for about 10 minutes, adjusting the seasonings as needed.